The story of Native Americans and pilgrims sharing a healthy fall harvest dinner usually arises only around Thanksgiving. Yet with all those wonderful farm-to-table choices, many of us will spend the holidays over canned sauces, sugar-sweetened pies and green beans smothered in mushroom soup concentrate—hardly authentic or hearty Native American foods. The revival of authentic Native American cuisine, however, is building momentum in the hands of forward-thinking native chefs in Florida and the Southwest United States. Although roast turkey was likely absent at the unified harvest celebration in 1621 on the East Coast, turkey and other game birds were a part of the Seminole peoples’ regular diet. A Smithsonian Institution report from1883-1884 noted, “The Seminole… is never at a loss when he seeks something [good] to eat,” only because Florida’s environment provided an abundance of foods. In addition to quail and duck, the Seminole tribe also brought deer, pigs, opossum, rabbits and the occasional bear to the table. The sea offered fish, turtles and oysters, and the industrious tribe skillfully cultivated a variety of grains, vegetables, roots and fruits. The Seminoles ate socially—and informally. Ethnographers in the 19th century reported that food was almost continuously prepared at the campfire, the tribe’s social hub. During regular mealtimes, individuals sat around a good-sized kettle containing stewed meat and vegetables; however, the Seminoles were welcome to eat whenever hunger struck, the kettle and big spoon always ready. The Seminole tribe generously shared food at all times, yet particularly during communal gatherings. Throughout the years, the Seminoles’ communal aspect of preparing food and dining has persevered. Historical photographs from the Seminole Ah-Tah-Thi-Ki Museum in Clewiston demonstrate the collective aspect of meal preparation: men fishing together in a traditional dugout canoe; children watching a woman pounding maize; and a gaggle of women tending to a pot on the fire. The tribe depended upon each other to produce a hearty meal, and families eagerly crowded beneath open-air chickee huts to share that bounty. The Seminole tribe preserves native cooking methods by continuing to educate the next generation. Last year, for example, Seminole chefs led a popular six-week cooking program after school. 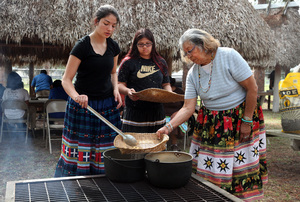 Earlier this summer students at Pemayetv Emahakv (Our Way) Charter School in Okeechobee “stepped back in time as they prepared a communal meal” during a day full of cultural activities, as noted in the tribal newspaper, The Seminole Tribune. The children cleaned fish and chopped swamp cabbage to accompany the meal of a 200-pound hog and roasted water turtles. Additionally, Native American cuisine aids in the general quest for whole, natural, local and sustainable foods. Boris Revilla, food and beverage director at Pueblo Harvest Cafe, says, “Native American cuisine represents the original local, fresh, healthy approach to eating―and it’s full of delicious flavors,” proving there are many benefits of eating traditional Native cuisine, he adds. Native American food is gaining a larger public foothold, and native restaurants are often opening that door. In New Mexico, for example, Pueblo Harvest Café seeks to expose diners’ palettes to indigenous ingredients in exciting ways by reinterpreting them. For example, their Three Sisters Ratatouille dish incorporates traditional squash, beans and corn, yet features a black-bean puree and sweet corn. Modern reinterpretations invite foodies to sample native cuisine; recipes may bring a rich Spanish mixture of chiles, sautéed cactus and calabacitas con puerco, for example. In Minneapolis, The Sioux Chef uses food as a platform for Native American cultural outreach. The catering company holds foraging events and leads cooking classes, disseminating ancestral knowledge as tribal members also reclaim their gastronomic heritage. 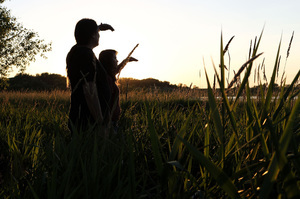 These educational initiatives invite Americans of every background to learn about Native American culture, thereby increasing their presence in general American culture, by way of food. With its rich history, Native American cuisine is not just a trend and can be appreciated any day of the year, not just on Thanksgiving.